Experience the Santa Barbara Zoo and learn about its living treasures, conservation efforts, high quality animal care, in a two to three hour experience suited for all ages. 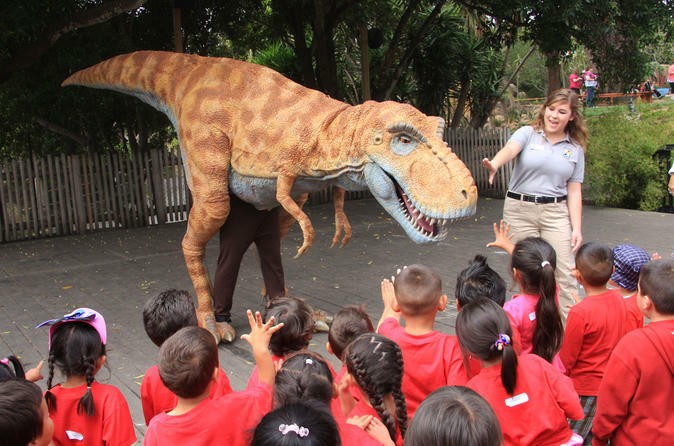 While in the park take advantage of other attractions such as our live stage shows, a five star high-tech dinosaur puppets, including Duncan the T. Rex and his friends, or Tiny the storytelling grizzly bear. Guests can also hand-feed the giraffes, ride the Zoo Train, pan for gems at Tiny’s Mining Camp, or Climb for Condors on a 26’ rock wall. Food is available at two restaurants and there’s shopping for souvenirs at the Zoo Gift Shop and the Explore Store. Known as “one of the world’s most beautiful zoos,” the Santa Barbara Zoo is located on 30 acres of botanic gardens and is home to nearly 500 individual animals. The giraffes have a view of beach volleyball, due to its location on a hill overlooking popular East Beach, as well as the Pacific Ocean, Channel Islands, Santa Ynez Mountains, and city of Santa Barbara. It is accredited by the Association of Zoos & Aquariums (AZA), representing the highest level of animal care, and participates in AZA endangered species programs for Asian elephant, Amur leopard, and Western lowland gorilla, among others. California Trails exhibit features endangered or threatened animals from the Golden State, including rare California condors, island foxes, and desert tortoises. African species include lions, Masai giraffes, slender-tailed meerkats, and Western lowland gorillas. Asian small-clawed otters, giant anteaters, golden lion tamarins, and both Amur and snow leopards are visitor favorites. Bird fans flock to see the zoo’s Humboldt penguins, Chilean flamingos, and two walk-through aviaries.